If you're someone who justifies poor eating habits based on cost, it's time to look in the mirror and determine whether you're misinformed, complacent, or both. "Eating healthy is too expensive!" As someone who has been involved with fitness since my undergraduate degree in Kinesiology, I've heard this statement countless time. Now as a Nutrition Coach, I help people eat well on all sorts of budgets. Given my experience, let me explain not only why this statement is false, but why the opposite is very true. When addressing this common claim, we must first acknowledge that it isn't just an apple vs. cookie comparison. The cost of food sources themselves is a natural place to start, but there is a trickle-down effect from poor eating habits that can lead to significant expenses over time. Let's investigate. I can safely ballpark about $25/day on food while eating very well. One consideration would be if I ate out more often (which I do sparingly), because eating healthy outside the home is easily more expensive than eating poorly. On that note, eating for convenience typically results in less trips to the grocery store and more trips to local eateries. Although this can seem cheaper, constant consumerism adds up. 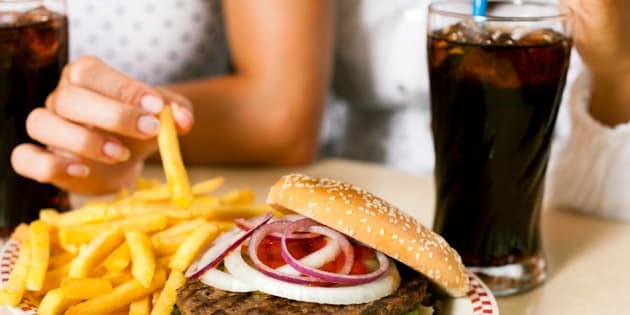 If you stick to fast food places for 3 square meals, you can break the $25/day mark, but one meal at a decent restaurant and your bill can easily double. The argument can be made that eating poorly at home (via processed food) is less expensive than buying healthier groceries, but when chips and chicken fingers run the same cost as eggs and broccoli, you're fighting a losing battle. Furthermore, the argument that only organic food is healthy is asinine: example one,example two, and example three. Finally, arguing that healthy food goes bad too quickly isn't an argument on cost, but a testament to poor planning. Eat your fresh food before non-perishables and no food or money gets wasted. Verdict: Effort, not cost, is the real barrier to eating well. The only way to make eating poorly more affordable than eating for health is to eat off the value menu at McDonalds three times per day. While cheaper, few readers are willing to be this destructive to their health for the sake of a few dollars saved. Research over the past few years has demonstrated a clear link between skin issues and high-glycemic diets (i.e. diets high in sugar and processed carbohydrates). Poor diets increase the chances of developing skin diseases and speed up the natural aging process of skin. The free solution (and prevention) is to eat better. The costly solution is to buy cover-up cosmetics or expensive cosmetic procedures. Few people link diet with these cosmetic expenses but given that poor eating habits greatly impact skin issues, the cost of buying low-quality food adds up over time. In the same vein as cosmetics, there's a clothing cover-up for weight gain. Society encourages fashion and consumerism, so there's no deterrent for outgrowing clothes. When your body doesn't fluctuate in size, clothes last much longer and a clothing budget has nothing to do with food costs. Unfortunately, those who eat poorly often feel the need to invest in things like shapewear, Spanx, billowing tops, extra-wide belts, and even jewelry to draw attention away from not-so-proud areas. Instead of addressing the core issue by working to improve habits and health, people spend hundreds of dollars to "distract the eye" with fashion while failing to improve health or self-esteem. Much money and frustration can be saved by investing in health instead of a new wardrobe that will soon be outdated. Although many medical costs are covered by the Canadian health-care system, many more are not. Chronic poor food choices contribute to all forms of disease, from diabetes to cancer, to heart disease, Alzheimer's and more. Eating well is powerful preventative medicine and can even reverse certain diseases. Did you know that olive oil has the same benefits as most statin drugs? #fact. Canadians who eat poorly ruin their bodies while benefiting from having a great health-care system (where every Canadian citizen contributes roughly $4,000 annually, and where the fees of everyone pay for the costs of the sick). With this being said, if you need something like prescription drugs that aren't covered by a benefits plan, the cost of chronic poor eating choices shoots through the roof. The fallback options to avoid prescription drugs are too often fad diets and fat-burning supplements, because it's easier to take a pill than uproot engrained habits. Not only are these options an ineffective waste of time, but they can be hard on the wallet as well. Tip of the day: Supplements will only work to supplement an already healthy diet; if they were designed to solve a problem they'd likely be called solutions. North American culture is riddled with Band-Aid solutions and lazy social norms. Having written this article, I'd now argue that it's even more affordable to eat well, have a gym membership and work with a personal trainer than it is to eat like crap, ignore fitness, and incur some of the aforementioned costs. If you're someone who justifies poor eating habits based on cost, it's time to look in the mirror and determine whether you're misinformed, complacent, or both. There are many free resources out there to help you get started and if you ever have questions about diet or exercise you can always Tweet me @dainwallis. Time is the one thing we can't buy in this world and health is the only necessary precursor to enjoying the limited time that we have. Eat well, save your money, improve your health and increase your joy in life.